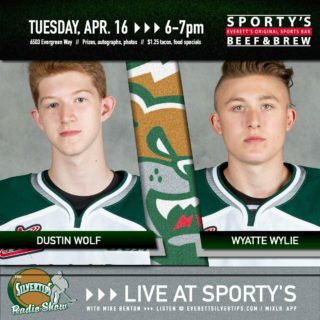 EVERETT, Wash. – The Silvertips flooded the stat sheet tonight while setting a franchise record with having scored six goals in a single period, as the Everett Silvertips blow past the Lethbridge Hurricanes, 9-1, before a sellout crowd of 8,343 fans at A.O.T.W Arena on Saturday night. Zack Andrusiak recorded his sixth hat trick of his career, and first as a Silvertip, while he recorded four points on the night. There were 14 Silvertips who recorded a point in tonight’s game, six of who had multi-point nights. The Tips also scored five power play goals (breaking a six-game drought), tying a franchise record for most in one game. Andrusiak’s hat trick was his first as a Silvertip and fourth this season. UP NEXT: The Tips play the Seattle Thunderbirds back-to-back nights starting Feb. 1, in Kent, then return home on Feb. 2, for a 7:05 p.m. puck drop. (1380 AM / 95.3 FM / WHL Live). 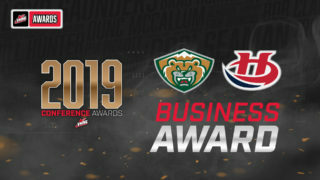 Tickets available at www.everettsilvertips.com/tickets. 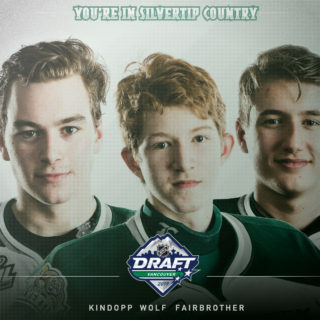 Everett defenseman Artyom Minulin buried his first goal as a Silvertip with a rocket from the blue line at 14:33, which put the Silvertips up 1-0. Andrusiak added to the Tips lead, 2-0, at 17:59 with a one-timer in front of the crease off a centering pass Bryce Kindopp, who stole the puck from goatlender Bryan Thomson in the trapezoid. Everett finished the opening frame with 17 shots on net, while Silvertips goaltender Dustin Wolf stopped six-of-six shots. 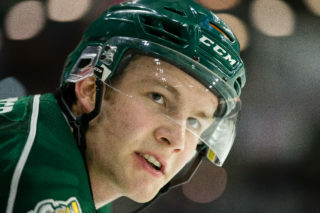 Andrusiak collected tacked on another goal for Everett, where he collected a rebound in the slot and hammered home his second goal of the night, 29 seconds into the second period, which put the Silvertips up 3-0. Silvertip captain Connor Dewar put the Tips up 4-0 as he wired a wrist shot from the right circle at 5:21. Defensive pairing Ronan Seeley and Sahvan Khaira both recorded assists on the play. Everett center Reece Vitelli added another goal to the Silvertips’ lead, 5-0, at 9:18, with a sleek toe-drag from the far circle that beat Lethbridge back-up goaltender Carl Tetachuk blocker side. The Hurricanes retaliated 20 seconds later with a goal of their own, which made it 5-1 at 9:38. Lethbridge winger Justin Hall scored while center Noah Boyko recorded the assist. Andrusiak then scored his hat-trick goal to extend the Everett lead to 6-1 at 12:47 with a one-timer from the circle off an assist from Dewar lingering at the point, fed by defenseman Wyatte Wylie. The goal began a barrage of three Tips goals in a span of 1:14. Everett winger Bryce Kindopp notched his first goal of the night at 13:03, which made it 7-1, as he banged in a one-timer from the slot as he received a centering pass from Andrusiak and Robbie Holmes. Everett defenseman Gianni Fairbrother joined in on the fun, as he made it 8-1 at 14:01, as he buried his shot from the point off assists from Khaira and Gage Goncalves. Everett finished the second by adding 20 more shots on goal, totaling in 37 shots after 40 minutes. The Hurricanes landed 16 shots on net after two. Everett increased their lead to 9-1 just 14 seconds into the third, as Dewar received a stretch pass into the zone and connected a cross-crease pass to Kindopp, who buried his one-timer attempt. The Silvertips finished the game with 46 shots on net, while Wolf finished with 31 saves. 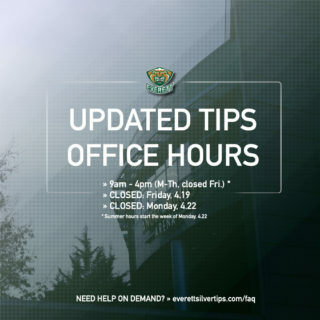 NOTES: Silvertips scratches included Riley Sutter, Jalen Price, and Conrad Mitchell … This is the first and only meeting between Everett and Lethbridge this season and the Tips won their first meeting at home against Lethbridge for the first time since 2014-15 … The Tips entered this week #7 in the CHL Top-10 rankings … Everett has won five of the last seven meetings with Lethbridge … Everett has won or gained a point in 27 of the past 34 games … their 72 points are second most in the WHL and top of the Western Conference.